Thaksin Shinawatra seized power in 2001 and then was exiled from Thailand after the military coup d’etat in September 2006. He himself is still the focal point of serious political conflict taking place in contemporary Thailand. He has always been attacked by anti-Thaksin groups on account of the following reasons: extreme power concentration, the political style of Thaksinocracy, nepotism, corruption, and populism in favor of rural people. However, very few scholars have focused on his political and social reforms which aimed at modernizing the Kingdom of Thailand in order to reorganize the country into a strong state. This article seeks to clarify the characteristics of the Thaksin government as a “destructive creator” of existing power structure and traditional bureaucracy. 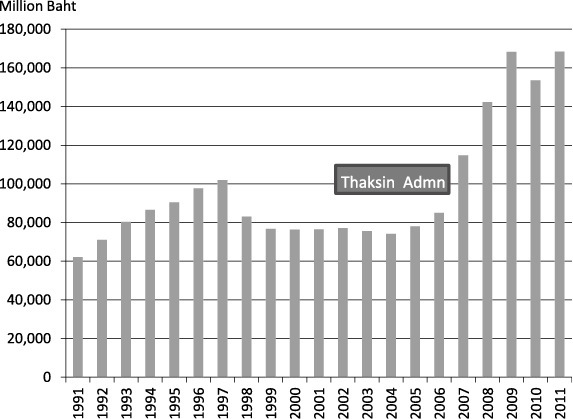 The article offers a brief discussion of Thaksin’s populist policies such as village funds, 30 baht medical services, and one tambon one product (OTOP) project, and then explores the background of, the process behind, and the policy results of two major reforms undertaken by the Thaksin government in the public sector (bureaucracy) and the budget system. These reforms appear to have transformed Thailand from a traditional bureaucratic polity into a modern state in conjunction with an emerging middle-income country in the global capitalism. But Thaksin’s ambitious reforms ultimately collapsed because they were too radical and too speedy for all the people, including royalists, the military, government officers, as well as conservatives. Likewise, the mass media of Thailand criticized Thaksin’s management of the state on the grounds that he had provoked a serious national crisis owing to the concentration of power, prevalence of nepotism, wide-ranging corruption, and destruction of democracy under his watch (Nariphon 2006; Wichai 2006). However, viewing the military coup simply as the result of a conflict between the movement of democratization and Thaksin’s dictatorship, and a product of popular protest against a corrupt government does not offer an adequate understanding of why the coup happened as well as an insightful analysis of fundamental problems facing contemporary Thailand under the strong pressures of globalization and economic liberalization (Suehiro 2009). After the 2006 coup, Thailand has suffered continuous political instability due to the conflict between the pro-Thaksin group or red shirts group and the anti-Thaksin group or yellow shirts group. For the past six years from 2007 to 2012, analyses of Thai politics and society have significantly deepened. Those who focused on the sharp conflict between the red shirts group and the yellow shirts group began to turn their attention to more fundamental problems rooted in Thai society, namely, the widening gap in income and assets among the people (not poverty problems), and the basic conflict between the mass people (lower-income class) and the traditional ruling elites (royalists, military, bureaucrats, and capitalists) (Montesano et al. 2012). However, these arguments fail to provide explanation of the real cause of the military coup in 2006. More importantly, they fail to provide a comprehensive explanation of the impact of Thaksin’s reforms on Thai politics and society. Given this situation, we still need to explain the real cause of the military coup as well as the total picture of reforms undertaken by Thaksin. We should not overlook the fact that Thaksin was Janus-faced in his style of state management: he presented himself as an ambitious populist3) as well as an active state reformist. These two faces exactly correspond to two world-wide movements during the 1990s: the political movement for democratization and the economic movement for glob­alization and liberalization. As Tamada cogently pointed out, the 1997 Constitution was a direct product of the democratization movement after the May 1992 bloody incident, or Phrusapa Thamin, in Thailand. Ironically, the 1997 Constitution also created a “strong prime minister” like Thaksin Shinawatra through changes in general election system, new regulations on the activities of political parties, increased authority of prime minister, and elimination of parliament members from cabinet members (Tamada 2005; Tamada and Funatsu 2008). It was the enhanced executive power of Thaksin that enabled him to implement his populist policies, and in turn contributed to his great popularity among the people. On this account, many scholars including anti-Thaksin group and mass media have frequently analyzed Thaksin’s management of the state by focusing on his populist-oriented policies such as village funds, people’s banks, one tambon (village) one product movement or OTOP, and 30-baht universal health services (Worawan 2003).4) But these projects are only one part of his overall policy objectives, and populist-oriented policies have reduced importance in his reform efforts after February 2005, when a ruling party of Thai Rak Thai or TRT won 377 out of the total 500 seats in the House of Representatives in the general election. Thaksin’s second face, that of a state reformist, revealed itself in 2005. Indeed, he attempted to remake the Kingdom of Thailand into a modernized state that would survive the world-wide waves of globalization, economic liberalization, and IT revolution. In his eyes, old-fashioned management of the state would isolate Thailand from global capitalism. An economically advanced country needs to reform its institutions, practices, and social values in line with the new international circumstances, just as a modern corporation needs to reform its management in keeping with the times (Pran 2004, Vol. 1; ­Suehiro 2009, Ch. 5). Such assumptions are apparent in his Kingdom of Thailand Modernization Framework or the KTMF. KTMF was addressed to foreign and domestic investors who were present at the prime minister’s residence in December 2005, and provided detailed information on the Mega Projects amounting to 1,800 billion baht (Shukan Tai Keizai, January 30, 2006). Interestingly, Thaksin also used other key words such as knowledge, technology, management, and finance to explain the KTMF. The major obstacles to the KTMF, in Thaksin’s view, are the old-fashioned public sector and the conservative culture of government officials (Pran 2004, Vol. 1, 300–301).5) Consequently, his reforms were naturally directed at the public sector (Thai-style bureaucracy) and the budget system under the control of the bureaucracy. He aimed to fill the gap between the economic status of Thailand as a middle-income country and her poor-performing institutions which had failed to ride the new wave of international movements. This article aims to clarify the changes in Thai bureaucracy and technocracy under the Thaksin government (between February 2001 and September 2006) in particular the effort to transform Thai bureaucracy into Thaksinocracy (Thaksinathipatai) rather than democracy (Prachathipatai) by answering the following questions: what were the major characteristics of Thaksin’s style of state management or Thaksinomics (section II)? how has Thaksin changed the mechanism of decision-making in order to reform the Kingdom of Thailand (section III)? what kind of socio-economic policies were introduced (section IV)? how did Thaksin view the traditional bureaucracy and how did he reform the public sector (section V)? how did he change the budget system to promote his strategic agenda (section VI)? and finally, what were the results of his drastic reforms (section VII)? Through these arguments and the follow-up of the political turmoil after the 2006 coup, I explore the essence of Thaksinomics and Thaksinocracy rather than provide mere criticism of his arbitrary use of state power. Originally, “Thaksinomics” is a term employed by the mass media and scholars to criticize Thaksin Shinawatra’s political style. But after 2003, Thaksin himself also began to employ this term in his speeches to express his own political thought as well as his strategy of “dual-track policies” (Pran 2004, Vol. 1, 26–38). Based on my observations, Thaksinomics consists of three major elements: 1) a corporate approach to management of the state; 2) a strategic approach to reform of public services as encoded by the slogan, “vision, mission, and goal”; and 3) a dual approach to revitalize Thai economy and society, or so-called “dual-track policies” (nayobai khuap-khu). His idea seems to have percolated from his own experience as the top leader who controlled the Shin Group, the largest business empire of the telecommunications industry in Thailand.7) He also borrowed his idea from the arguments of Somkid Jatusripitak, a professor of National Institute of Development Administration (NIDA), as laid out in his remarkable papers on “Thailand Company” as well as “A Leader in the Future” (Somkid 2001, 76–80; Wirat 2001). Thanks to these ideas, Somkid served as one of the key members of the TRT executive committee, and was later appointed Finance Minister when Thaksin set up his first government in February 2001. Second, Thaksin ordered all the government agencies including public schools and hospitals to clarify their own “vision, mission, goal” (wisaithat, na-thi, paomai) in reference to their tasks for the people. He requested this clarification at each level of government agencies from ministerial level through departmental and divisional levels, and finally to the individual level. At the same time, they are all subject to performance evaluation by both internal bodies and third-party team in reference to the initial targets of each group. Analogous to a company management, strategy and competition were deemed by Thaksin as essential instruments for improving public services, and therefore he claimed a strategic approach rather than experience-based practices. Third, he introduced the new agenda of dual-track policies, which aimed at pro­moting a grass-roots economy (setthakit rak-ya) in rural areas on the one hand, and enhancing international competitiveness among big firms in urban area on the other.8) What is unique about Thaksin’s policies is that the main purpose for promoting the grass-roots economy is not to reduce poverty in rural areas (the traditional style politics of clemency and charity), but to give chances or opportunities for rural people to ­create their own business and employment (a new style politics in the era of the global capitalism). In this context, Thaksin promoted “community business” (thurakit chumchon) through programs of village funds, people’s bank, and OTOP movement, which adopted an approach to tackling poverty that was quite different from that adopted by previous governments. Promotion of the grass-roots economy also aimed to court votes in rural areas in favor of TRT in the next election (February 2005). This is the precise reason why Thaksin emphasized populist-oriented policies in his first government between 2001 and 2004. The above three elements combine with each other to characterize the Thaksinomics. However, Thaksin’s political style was attacked by mass media and academic circles for leading to “policy corruption” (Pasuk and Baker 2004), “prime ministerialization” ­(Bhidhaya 2004), “Thaksinocracy” (Thaksinathipatai) against democracy (Rungsan 2005), “Thaksinization of Thailand” (McCargo and Ukrist 2005), “Thaksin regime” (rabop ­Thaksin) (Nariphon 2006), and new nepotism or revival of family politics. Three aspects of these criticisms are worth noting. Secondly, many scholars also criticized the increasing concentration of power under his term as well as his dictatorial behavior. For example, Rungsan Thanaphonphan argued that while a CEO in a company was usually supervised and monitored by both the board of directors and shareholders, Thaksin did not brook any criticism from the outside. Accordingly, he was not a CEO of state in a real sense, but a one-man-show type of taoke (owner-operator) of the state (Rungsan 2005, 168–175). Finally, they criticized Thaksin’s politics for reviving nepotism. As a matter of fact, Thaksin appointed a lot of family members to key posts: his younger sister Yaowaret became chairperson of the National Women Association; another younger sister Yaopa was the clique leader of TRT; Somchai Wongsawat, Yaopa’s husband, was appointed permanent secretary of Justice and the prime minister (September–December 2008); and Priaopan Damapong, his wife’s elder brother, was given the number-two position at the National Police Office.9) Thaksin also appointed two cousins (Chaiyasit and Uthai) to the key posts of Army Commander-in-Chief and the permanent secretary of Defense, respectively (Athiwat 2003; Tamada 2005). It is fair to say that such nepotism in personnel management contributed to fueling anti-Thaksin sentiments among the military group as well as among the middle classes in the Bangkok Metropolitan area. Two characteristics distinguish the Thaksin government’s management of macro-economy compared with previous governments. First, Thaksin attempted to reduce public external debt and its ratio to nominal GDP, and obtain budget resources from the national revenue, profits of state enterprises, profits from privatization of state enterprises, and private investments. In spite of the fact that the NESDB projected public debt ratio against nominal GDP as 60% and over in the Ninth Five-Year Plan and the International Monetary Fund (IMF) requested recipient countries to meet 55% as the maximum standard, Thailand had successfully reduced this figure to less than 50% by 2003. When Thaksin operated his own private business (Shin Corp.), he preferred direct corporate finance based on issuance of stocks and corporate bonds to indirect corporate finance based on banking loans. In exact accordance with the strategy of corporate finance, Thaksin insisted on applying the principle of non-borrowing or stand-alone approach to the financial and fiscal management of a state. Additional revenue came from an increase in collection of corporate taxes, value added taxes, and excise taxes owing to economic recovery during the term of the ­Thaksin government. Along with the increase in tax revenues, an equally important development was the computerization of the state revenue collection system, which not only helped speed up tax collection procedures but also minimized unintentional failure in tax collection in the fields of excise taxes and value-added taxes. Additional revenues were separated from the ordinary proceeding of budget allocation and were eventually placed under the direct control of the cabinet, in other words the prime minister. Such free-hand revenue naturally became significant fiscal sources for the Thaksin government to promote money-consuming populist-oriented policies. I will return to this problem in section VI of this article. As Warr and Bhanupong have already argued, there are four core economic agencies in Thailand: the National Economic and Social Development Board or NESDB, which is the government’s main economic planning agency; the Fiscal Policy Office or FPO of the Ministry of Finance for the management of public finance; the Bureau of the Budget or BOB of the Prime Minister Office for the estimation of state revenue; and the Bank of Thailand or BOT for financial arrangement (Warr and Bhanupong 1996, 69–70; see Fig. 1 in Suehiro 2005, 17). These four core agencies have played a preeminent role in the process of national budget allocation since the 1960s, and have been fully responsible for the stable development of the macro-economy. The NESDB principally screens the bottom-up investment plans of each ministry and department in reference to the targets of the Five-Year Plans, while the BOB investigates revenue aspects. The FPO proposes the possible government expenditure, consistent with the monetary policy of the BOT. The four core agencies have traditionally cooperated with each other through their personal networks under the leadership of the distinguished governor of the BOT, Dr. Puey Ungpakorn, and have maintained their policy independence from the political influences of military forces ­(Suehiro 2005, 22–28). When Thailand experienced long-term economic recession in the early 1980s, the interrelationship among the four core agencies changed. Since the Prem Tinsulanond government applied for standby credit from the IMF and structural adjustment loans (SALs) from the World Bank between 1981 and 1983, the NESDB and the FPO began to play more important roles in managing and monitoring public external debt from these international organizations (Muscat 1994, Ch. 5). In addition to the expanded role of the two agencies, the Prem government also established three important institutions to implement macro-economic policies. These three are the National Public Debt Com­mittee chaired by the finance minister; the Economic Ministers Meetings, which exclusively discussed economic matters before the regular cabinet meeting; and the Joint Public and Private Sector Consultative Committees (JPPCCs, or Kho.Ro.Oo.) to argue jointly current economic problems (Anek 1992, Ch. 4; Suehiro 2005, 32–35). At the same time, the NESDB was expected to serve as a coordinating organ for these national committees in addition to its original task of planning the Five-Year Plan. When Chatichai Choonhavan (Chart Thai Party) won the 1988 election, he established the first political party-based coalition government in Thailand. But he hardly changed the existing policy-making system. It is true that the Finance Minister was not appointed any more from qualified persons of the Ministry of Finance, but was picked from the ruling political party. And the Finance Minister sometimes intervened in both fiscal policies of the FPO and monetary policies of the BOT (Suehiro 2005, 37–39; Apichat 2002). But there was no noticeable change in the process of policy-making. Technocrats at the four core agencies could still continue to manage macro-economy as long as they did not touch on the sensitive business interests of political party leaders and royalist members. The currency crisis of 1997, however, changed the roles of the four core agencies. The major developments in economic policy-making under the second Chuan government (1997–2000) may be summarized as follows. First of all, since the government decided to request standby credits from the IMF and SALs from the World Bank to overcome the crisis, the two international financial organizations came to play a decisive role in formulating the economic reforms of ­Thailand. Second, the Finance Minister, Tarrin Nimmanhaeminda, was given supreme power to control the financial sector and to negotiate with international financial organizations as well as Japanese government agencies.13) Tarrin was the key person of the Democrat Party, which was the ruling party of coalition government, and was former president of the Siam Commercial Bank. Third, the policy role of the FPO was diminished, in comparison with its role in the era of the Prem government. The Public External Debt Section was separated from the FPO to independently handle the growing loans from the IMF, the World Bank, and Japanese government. Along with this organizational restructuring and transfer of ­several sections, the number of FPO staff was cut from 250 to 150 by 1999. Instead, the Economic Ministers Meetings began to play more important roles. The meetings which were held every Monday ahead of the Tuesday cabinet meeting eventually made the final decisions on economic matters (Suehiro 2005, 44). Fourth, the Chuan government increased the number of the Deputy Minister (Phu chuai rattamontri-wa) from 8 to 24 persons in addition to 4 Deputy Prime Ministers and 13 ministers in order to invite influential political party members into the coalition govern­ment.14) The posts of the Deputy Ministers in several ministries such as the Ministry of Transport and Communications were very attractive for party leaders seeking political rents. In brief, the major players in economic policy-making diversified into four groups: 1) international financial organizations (IMF and the World Bank); 2) economic technocrats in the NESDB and the Ministry of Finance; 3) particular political party leaders in the positions of the finance minister, industry minister, and the deputy ministers in economic affairs; and 4) participants in the public hearings. Each group was inclined to seek its own interest without mutual cooperation and policy consistency. Such fragmentation of decision-making became the object of Thaksin’s criticisms, which targeted the structural weakness of the Thai public sector. The Thaksin government appeared to have aimed at completely changing the traditional policy-making system, despite the carryover of human resources from the Chatichai governments.16) The new institutional elements may be summarized as follows. First, Thaksin abolished the regular meetings of the Economic Ministers on Monday, and replaced them with the meetings of the Strategy Committee17) to argue national urgent matters. The Committee reportedly consisted of Thaksin himself and leading figures from the Army, the National Police Office, and business circle, but there is no precise information on its membership. Second, he set up the five Screening Committees (later increased to seven ones) at the first cabinet meeting on March 6, 2001, and appointed five Deputy Prime Ministers as chairpersons of each committee to examine particular policy issues. Important policy proposals from responsible ministries including the NESDB were first submitted to these committees, and then discussed before final decisions were reached at the cabinet ­meetings. Third, he abolished the public hearings, and replaced them with the practice of direct dialogue with the people through his own speeches at the government-sponsored radio (FM 92.5) every Saturday from 8:00 to 8:30 pm. Between April 28, 2001 and August 19, 2006, his radio speeches continued to convey his political thought along with explanations of decisions of cabinet meetings.18) Thaksin appears to have put more importance on such type of direct dialogue with the people rather than on time-consuming discussion in the House of Representatives. 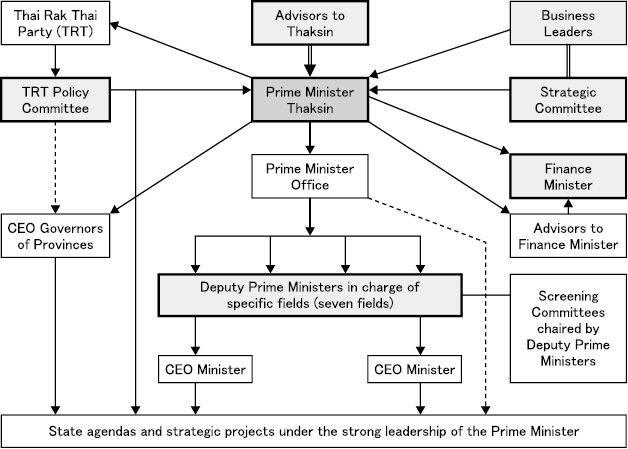 Institutional reform in policy-making system contributed to the strong leadership of the prime minister. This movement is clearly evident in Table 2, which compares the distribution of cases of policy submissions to the cabinet meetings in two periods of the Chuan government and the Thaksin government. Computing the average frequency of policy submissions to the cabinet meeting per month, we see that the Thaksin government tackled more cases (100.8 cases against 95.3 cases). And the role of the Prime Minister Office increased in the Thaksin government (19.1% against 17.6%). But the differences in these figures are not so impressive. Rather we should note the differences in major agencies responsible for submitting policies inside the Prime Minister Office. As Table 2 clearly shows, three groups or agencies of the Deputy Prime Ministers who chaired the Screening Committees, the Prime Minister Secretary Office, and the Cabinet Secretary Office became to play more significant roles in submitting policies. Looking at the increasing percentage of the NESDB (from 1.3% to 2.6%) in Table 2, some may argue in favor of the revival of the four core agencies. In actuality, however, Thaksin frequently ordered the NESDB to formulate new policies in strict accordance with the state strategies, as well as the ordinary task of planning the Five-Year Plan, which resulted in an increase in the number of cases of policy submissions from the NESDB. Ironically, increasing cases reflect the diminished role of the NESDB. Ministry of Finance also reduced its role in exchange of increasing role of the Deputy Prime ­Ministers. Fig. 1 shows the whole structure of the policy-making under the Thaksin government. Fig. 1 suggests the increasing concentration of power in the hands of the prime minister alongside the exclusion of bureaucratic influence from the decision-making ­process. Thaksin apparently aimed to replace the Thai bureaucratic polity with a prime minister-led politics or Thaksinocracy. Sources: Interview research by the author in Bangkok from 2001 to 2005. As discussed in section II, Thaksin adopted dual-track policies, which consist of promotion of the grass-roots economy in rural areas (the first track) and the enhancement of national competitiveness of big capitalists in urban areas (the second track). After establishing a new government, he favored the first track over the second one. This is in part because economic recovery from the Asian crisis became an urgent task for the country and in part because the first track was more essential for Thaksin and TRT to attract the support of the people. For these reasons, Thaksin announced nine urgent economic and social programs in his policy speech at the Diet on February 27, 2001. 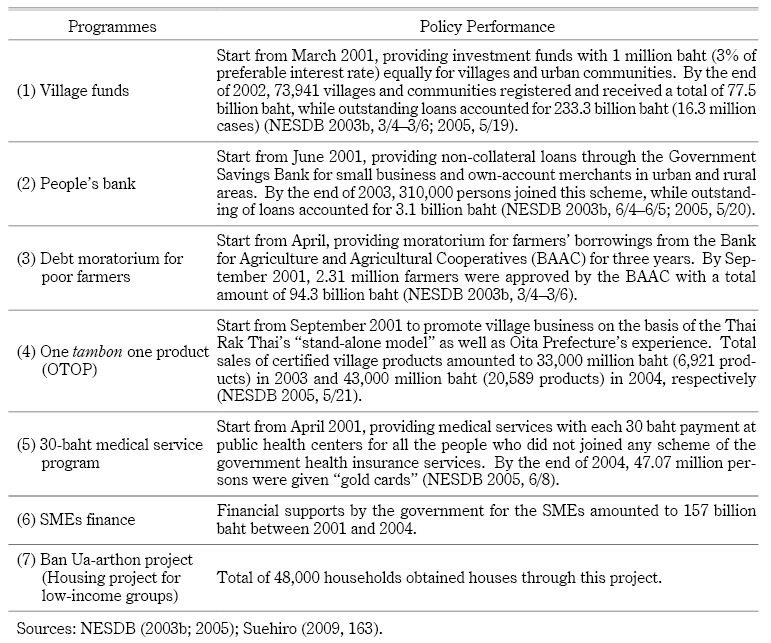 These nine programs include: 1) three years’ moratorium on farmers’ debt; 2) provision of village funds; 3) establishment of people’s banks; 4) establishment of new government-sponsored SMEs banks; 5) introduction of universal health services (known as “30-baht medical services”); 6) solution of non-performing loans through the Thai Asset Management Corporation (TAMC); 7) privatization of state enterprises; 8) eradication of drugs; and 9) anti-corruption campaign (Samnak Lekhathikan Khana Rattamontri 2002, 91–95). In addition to policies 1) to 5), Thaksin also introduced two well-known programs of OTOP and a “Ban Ua-arthon” project which provided lower-income households with cheaper housing facilities. Seven of the policies were originally part of the TRT campaign promises in the general election and became core projects of the first track or the promotion of the grass-roots economy. In July 2001, the Thaksin government announced the “mid-term economic policies 2001–2006” to the public. Before the cabinet meeting, NESDB and the Fiscal Policy Office prepared their original plan which was principally based on the Ninth Five-Year Plan (2001–2005). But this plan did not fully reflect Thaksin’s policy speech in February. Glancing at the original plan, Thaksin got angry and immediately ordered the NESDB to revise it in accordance with his policy speech. Consequently, the revised agenda was submitted to a cabinet meeting in July, which included all the programs in both prime minister’s policy speech and the TRT campaign promise.21) In Thaksin’s view, the NESDB ought to follow the state strategy addressed by the prime minister rather than the targets of the Five-Year Plan set by the former government. This incident symbolically highlights the declining autonomy of the NESDB in policy-making. Table 3 summarizes the major programs in the first-track policies. All the programs started within 2001 and total expenditure amounted to 300 billion baht, or the equivalent of 30% of total budget allocation in FY2002. As the table shows, each program achieved a visible outcome, which contributed to the huge popularity of the first Thaksin government. On the other hand, the enormous amount of expenditure for these populist-­oriented policies provoked severe criticism from the mass media on the grounds that these programs were undertaken without ordinary budget allocation (off-budget system). In section VI, I will return to the important question of how the Thaksin government financed these policies under the existing budget system. Unlike the IRP which focused on the improvement of efficiency and productivity of manufacturing sector through the development of supporting industries (Japanese ideas), NCP imported key concepts such as innovation and industrial clustering based on the policy advice of Porter as well as textbooks in the American business schools (Porter 2003). The complete text of NCP was submitted by the NESDB and approved by the cabinet meeting in October 2003. Although NESDB was officially designated the responsible agency of NCP, the actual people in charge were Porter and the SASIN which was the most influential business school in Thailand. NESDB could no longer take initiative as a primary planner, and merely served as a coordinator for planning. After the general election in February 2005, the second Thaksin government explicitly shifted its policy priority from the first track in favor of the people to the second track in favor of domestic and foreign investors. Since TRT had won 75% of seats in the House of Representatives, Thaksin did not need to pay special attention to the masses as he had to do before. For instance, in May 2005, the Ministry of Finance announced “Mega Projects” with a total cost of 1,800 billion baht and appealed to foreign investors to invest in attractive mass transportation projects in Bangkok Metropolitan area. In the same period, Thaksin also ordered the NESDB to formulate the 10th Five-Year Plan (October 2006–September 2011), which emphasized profit-making agriculture on the basis of ­bio-technology and provincial cluster development plans based on the CEO ­Governors. Unlike the Ninth Five-Year Plan, the new plan accorded less importance to traditional policy objectives such as poverty reduction in rural areas (World Bank 2001).23) From the middle of 2005 onward, Thaksin also accelerated the privatization of state enterprises to attract more foreign capital to the local stock market. All the programs were integrated into state strategies to modernize the Kingdom of Thailand (KTMF) (Suehiro 2008). From Thaksin’s viewpoint, there are two major obstacles to KTMF’s ambitious strategy aimed at transforming Thailand into a modern state. One is the traditional bureaucracy, including government officers’ culture, and the other is the existing budget system under the strict control of line ministries. Consequently, he focused his political targets on the two major fields of the public sector and the budget system. The first obstacle to Thaksin’s reform is the old-fashioned bureaucracy. According to his observation, Thai bureaucracy has too many agencies and there is no organic linkage in activity between organizations. Thai public services are too slow despite global capitalism’s “economy of speed.”24) He also severely criticized the traditional bureaucracy because it lacked efficiency in delivering public services, had no strategy in policy-­making, and lacked competition in the work place. Rather it merely encouraged bonding among its members and a conservative attitude against any criticism coming from the outside. On September 11, 2002, Thaksin addressed the issue of “Reform of a country, reform of the public sector” in the prime minister’s residence. In this speech, he disclosed the fact that he ordered the Prime Minister Office to disband around 300 out of 600 national committees, and revealed his plan to reorganize existing government agencies into more networking-based and agenda-based organizations (Pran 2004, Vol. 1, 291–308). More important, he emphasized in the same speech the necessity of reforming traditional bureaucratic culture and government officers’ consciousness. He claimed: “Most important task for us is to reform the old culture of work together into a new one at the levels of government officers, the relationship between public sector and a country, and the relationship between public sector and the people. We need a new culture of work together. We cannot make the excuse that we have poor performance because our system is out-of-date. The era is always changing and it requests us a reform” (ibid., 300–301, underscoring by the author). On this account, he severely condemned the out-of-date system (rabop la-samai) and called for the introduction of modern public services on the basis of advanced tech­nology (e-Government), agenda-based organizations, explicit visions (wisaithat), well-organized strategy, and competition among government officers. Based on such views, he launched the reform of traditional bureaucracy by setting up the Public Sector Develop­ment Commission (PSDC) in October 2002 (Nakharin 2008). Before examining the activity of the PSDC, let me briefly review the structure of government officials and the mechanism of personnel management in the public sector in order to help the reader to understand the real cause behind the Thaksin’s reform. Fig. 2 shows the category of public personnel and the distribution of civil servants and employees by the category. Figures on the basis of my own research in 1996 are out of date for the current situation. However, there are no comparable figures and the present system principally follows the same category. 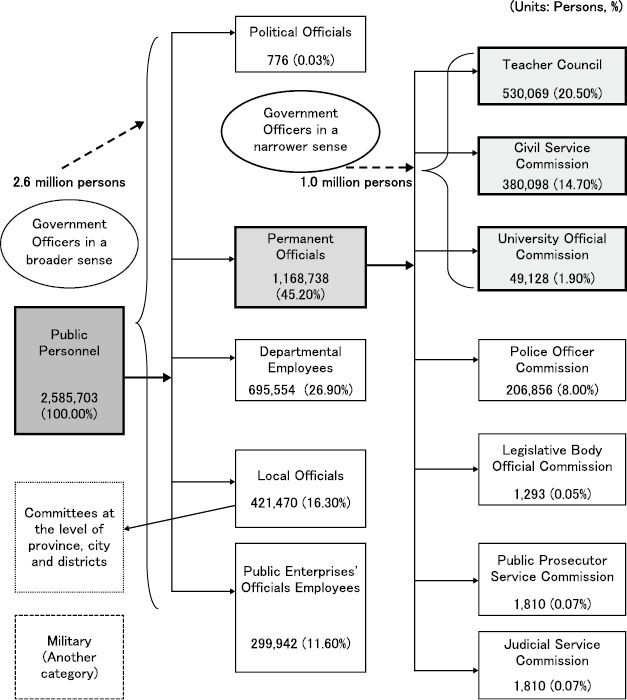 Therefore, I employ the 1996 survey to depict the structure of Thai bureaucracy (Suehiro 2006). Source: Interview research by the author at the Ko.Pho in Bangkok, April 1996. Public personnel (2,586,000 persons) consists of five major categories: political ­officials (776 persons); permanent officials (1,169,000 persons); departmental employees (695,000 persons); local officials (421,000 persons); and staff and employees of 23 state enterprises (300,000 persons). Among them, permanent officials belong to a category of government officials in a broader sense. Permanent officials are further classified into seven sub-categories including police officers and prosecutors. Among them, three groups belong to a category of government officials in a narrower sense. They include 530, 000 teachers at public schools under the auspice of the Teacher Council, 380,000 civil servants in central public agencies under the auspice of the Civil Service Commission (CSC), and 49,000 professors and lecturers under the auspice of the University Official Commission. Here, I focus on the second group of civil servants under the CSC. All the civil servants are recruited through standard examinations adopted by the CSC and otherwise through particular examinations conducted by several high-ranked ministries (Ministries of Interior and Foreign Affairs). After entering public agencies, they are all ranked in the P (position) and C (classification) table according to their final educational qualifications. For instance, a person with educational level of high school or vocational school is ranked as C1, while a new graduate from a university is ranked as C3-2. A Ph.D. holder starts his/her career at C5-4. The PC table is completely linked to the salary table, and every person is automatically promoted by at least one rank each year. What is unique to Thailand is that the government principally does not employ mid-career persons from the private sector. Those who desire to enter into the public agency must start their careers in the same way as fresh students in accordance with educational qualification. On the other hand, all the civil servants are guaranteed employment until the retirement age or 60 years old (since 1953), and they can equally enjoy the right to receive government pension, medical health insurance, and other fringe benefits. In this sense, personnel management of government officials has been basically designed as a closed organization on the basis of service years. Apart from the cases of director generals of the Department of Customs, secretary generals of the NESDB and governors of the Bank of Thailand (BOT), most of civil servants enter a particular department and are promoted to higher posts in the same department. 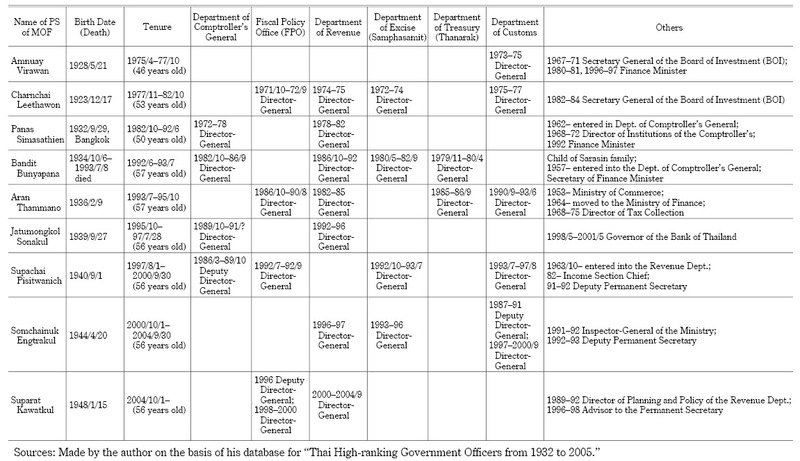 For director generals of the Department of Customs until the 1970s, several persons were recruited from the National Police Office (Krom Sulakakorn 1994, 11–31), while both governors of the BOT and secretary generals of the NESDB until the end of the 1980s were appointed from among the elites of the Ministry of Finance (Suehiro 2005, 58–59). Except for these cases, we see very few cases of personal transfer across different ministries, and even across different departments. 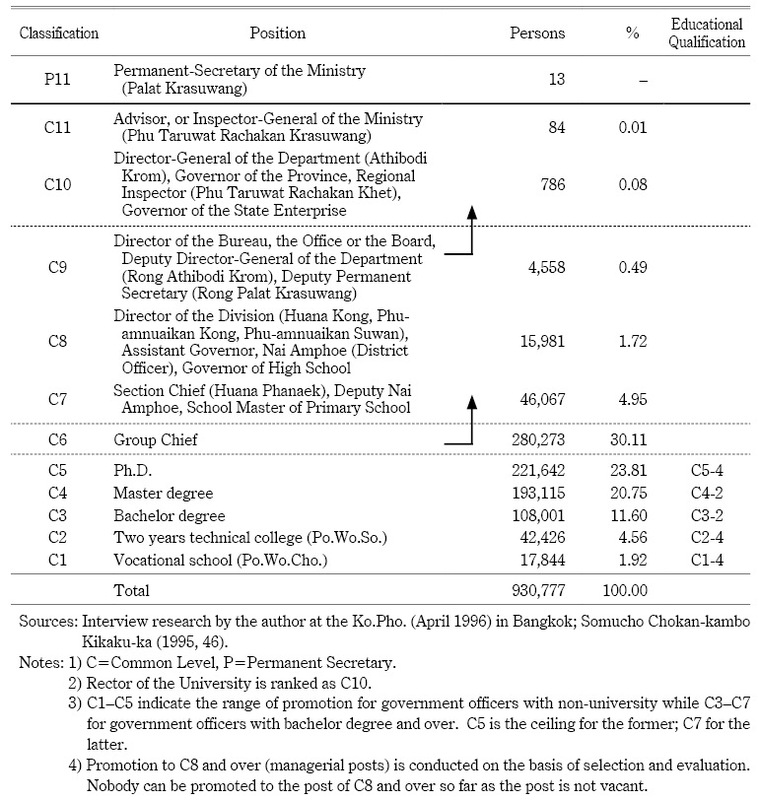 Personnel changes across at departments are basically confined to persons who will be promoted to the posts of director general, superintendent, and the permanent secretary.26) In addition to the strict rule of internally-promotion, three other principles seem to characterize personnel management in higher ranked posts of Thai bureaucracy. 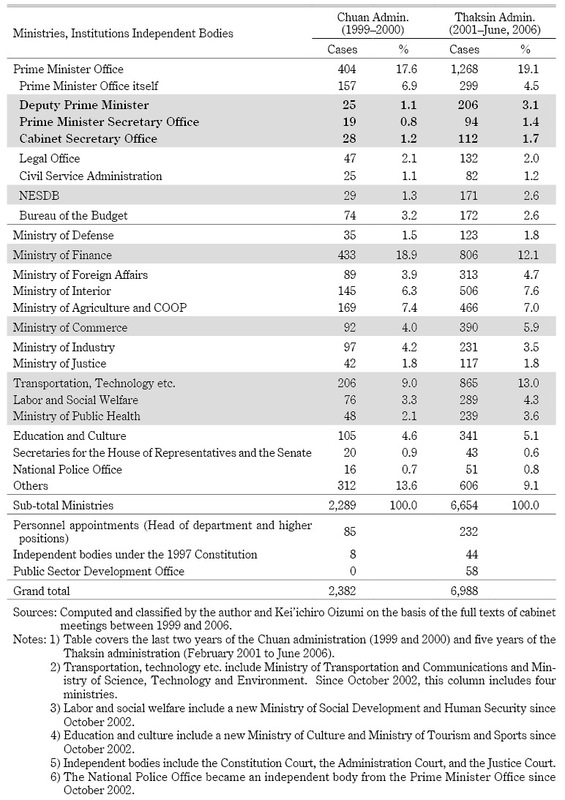 First, a permanent secretary is expected to have occupied the highest posts of important departments in each ministry. These posts include the Department of ­Comptroller General, the Department of Customs and the Fiscal Policy Office (FPO) for the Ministry of Finance; the Department of Foreign Trade and/or the Department of Internal Trade for the Ministry of Commerce; the Department of Medical Services and/or the Department of Health for the Ministry of Public Health; and the Department of Industrial Economics and/or the Department of Industrial Promotion for the Ministry of Industry. Second, the tenure of director general and permanent secretary is neither regulated by law nor determined by an implicit consensus, as is the case in Japan. Tenure is frequently determined by the will of superiors such as the permanent secretary and the ability of candidate. Consequently, the period of tenure varies very widely between one month and 10 years. From the 1990s onward, however, tenure seems to converge into two or three years, and the person is customarily appointed on October 1, and resigns on September 30, in accordance with the Thai fiscal year. Third, prior to the 1970s, there was frequent evidence of a “fast track system.” If a candidate had a good family background (royal or aristocrats family members), high educational qualification outside of Thailand, and prominent performance, he/she could obtain higher post faster than others. It was not difficult to find permanent secretaries in their mere 40s. Since the mid-1980s, however, the age of appointment to the post of permanent secretary began to concentrate in the range of 57 to 59 years old, or 1 to 3 years before retirement. This fact implies that the promotion to the post of permanent secretary has been standardized in a hierarchical structure. These characteristics have contributed to creating the stable structure of Thai bureaucracy. As I mentioned above, civil servants with lower ranks are automatically promoted according to their years of service, while an elite class with higher ranks is promoted on the basis of performance evaluation and good human relationship inside a particular organization. These rules naturally produce characteristics specific to the Thai bureaucracy, notably an inward-looking and conservative culture that is impervious to criticism from the outside. This is precisely the point that Thaksin attacked in the ­process of his public sector reform. Who Were Promoted to Permanent Secretaries? To test and confirm the rule of determining the promotion system, let me employ two case studies of the Ministry of Finance (MOF) and the Ministry of Interior (MOI) as examples. 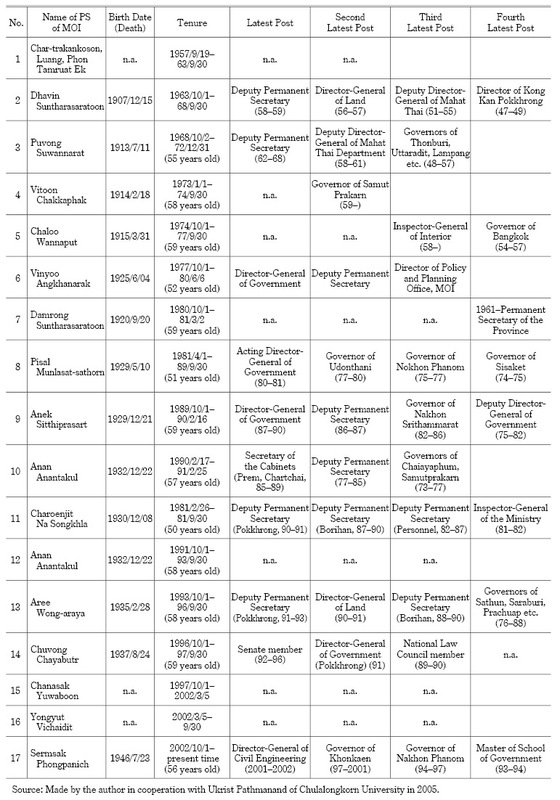 Table 5 summarizes the career path of each person who occupied the permanent secretary (PS) of the MOF between 1975 and 2005. Major facts derived from the table together with my research on PS’s educational qualification are as follows. 1)	The majority of these PSMOF was holders of Ph.D. or Master Degree (Economics), and was educated in prestigious universities in the United States and Europe such as Michigan University (Amnuay), University of Illinois (Panas), University of London (Suparat), and Cambridge University (Jatumongkol). 2)	Except for Aran (1993–95) who was transferred from the Ministry of Commerce, all the persons were promoted internally within the MOF. 3)	For the cases of Amnuay (1975–77) and Panas (1982–92), PSMOF were promoted with the ages of 46 and 50, and the tenure of Panas covered 10 years. However, since the period of Bandit (1992–93), a “fast track system” was replaced by a more standardized system in which the PS was appointed to the post three to four years before retirement, and his tenure was confined to two to three years. 4)	Before being appointed to the post of PSMOF, most of people had stints as director generals in at least three different mainstream departments of Comptroller ­General, Customs, and FPO. In recent years, main departments have shifted to the Department of Revenue and the Department of Excise due to the increasing authority in revenue estimates. A comparison of the cases of PSMOF and PSMOI reveals both similarities and ­differences in their promotion systems (see Table 6). 1)	Concerning educational background, based on my research, all the people of PSMOI were educated in local (not foreign) prestigious universities such as ­Chulalongkorn University and Thammasat University. And all the persons were further educated in the National College of Defense. 2)	Most of these PSMOI were promoted step by step from district chiefs (nai amphoe) to governors of multiple provinces to director generals of mainstream departments such as the Department of Government (Krom Kan Pok-khrong) and the Department of Local Government. The career path for PSMOI seems to be more institutionalized than in the case of the Ministry of Finance. 3)	Except for Chanasak (1997–2002), the tenures of all the persons were short (one to two years). Furthermore, appointment to PSMOI was conducted in accordance with regular personnel changes starting in October of each year. The cases of PSMOI suggest that personnel promotion of the high ranked officials has been completely dominated by the explicit rule of the line ministry. Even Interior Minister must follow this rule in personnel management. Since October 2002, the Thaksin government embarked on ambitious reform of the public sector in three different directions. These reforms include: 1) reorganization of government agencies on the basis of the agenda; 2) changes in personnel management on the basis of meritocracy rather than seniority system; and 3) improvement of public services according to the documented four year plan in each agency. Concerning the reorganization of the public sector, Thaksin ordered the restructuring of 14 ministries (plus the Prime Minister Office or PMO) with 125 departments into 19 ministries (plus PMO) with 156 departments.27) Contrary to the original plan of downsizing public organizations, Thaksin was forced to increase the number of government agencies. This is in part because he had to deal with the potential dissatisfaction of government officials by increasing the number of posts (departments), and in part because he planned to reconstruct government organization more strategically by allocating a particular agency for a particular agenda. For instance, the Ministry of Science, Technology and Environments (MSTE: four departments and five offices) was reorganized into the Ministry of Science and Technology (one department and three offices). At the same time, the Department of Energy Promotion belonging to the former MSTE was transferred to a new ministry (the Ministry of Energy), while two agencies of the Department of Environmental Quality Promotion and the Office of Environmental Policy were integrated into another new ministry (the Ministry of Natural Resources and Environment). Each agency was attached to an existing or new ministry according to its own agenda, while a lot of departments and offices were set up to undertake new state strategies such as the Department of Development of Thai Traditional and Alternative Medicine in the Ministry of Public Health, the Department of Intellectual Property in the Ministry of Commerce, and the Office of Welfare Promotion, Protection and Empowerment of Vulnerable Groups in the new Ministry of Social Development and Human Security. Concerning personnel management, Thaksin introduced a new system or promotion based on the principle of meritocracy. He empowered not the Permanent Secretary but the Minister to directly appoint director generals, and made it possible to transfer able persons across at different ministries, or to appoint younger persons regardless of the traditional order of P (position) and C (classification) system. Thus, in September 2004, Jakramon Pasukwanich, who was the former secretary general of the NESDB, was transferred to the permanent secretary of the Ministry of Industry, while Ampol Kittiampol, a director general in the Ministry of Agriculture and Cooperatives, was newly appointed to serve as secretary general of the NESDB. Naris Chaiyasut who was the former rector of the Thammasat University, was appointed director general of Fiscal Policy Office over possible candidates from inside the Ministry of Finance. At the level of director general, a lot of persons were selected by their abilities or their connections with TRT. Such system of promotion undoubtedly had a great impact on traditional order and familial relationship in each office, and in turn stoked strong resistance among government officials (Nakharin 2008). Finally, the Thaksin government set up the Office of Public Sector Development Com­mission (OPSDC) by appointing Vishnu Krua-ngam as its chairman on October 3, 2002.28) Major members include Bowornsak Uwanno, Chai-anan Samudavanija, and Orapin Sopchokchai, who had worked for the reform of public sector in the Chatichai government (1988–91) (OPSDC 2005a, 8–9). In May 2003, the cabinet meeting decided to approve an action plan submitted by the OPSDC which aimed to reduce by 30–50% the steps or the time needed for particular public service in each agency. The OPSDC document reported that the Department of Land Transport successfully reduced the time of issuing payment certification for automobile taxes from 30 minutes to 7 minutes, while the National Police Office reduced the time of arranging the formalities for going abroad from 15 days to 7 days (ibid., 12–13). In 2005, OPSDC accelerated the reform of public services on the basis of the “Action Plan of Public Services Development 2005–2008” under the second Thaksin government (2005–08). This action plan requested each agency to define the target, strategy, cooperation with other agencies, concrete plan to improve the efficiency of public services, and budget needed in the four-year plan (OPSDC 2005b; Samnakngan Ngop-praman 2006). The Action Plan of 2005–2008 had a substantial impact on both working style of government officials (overtime work etc.) and the existing system of budget allocation under the control of line ministries. Accordingly, let me move to another reform of the Thaksin government, namely, reform of the budget system. Another obstacle to Thaksin’s state reforms is the existing budget system in which most of the budget has been put under the direct control of responsible ministries ­according to their functions. In other words, responsible (line) ministries at first submit project proposals in conjunction with the targets set by a Five-Year Plan, while the four core agencies of the NESDB, FPO, BOT, and the Bureau of the Budget (BOB) consult with each other to decide on the budget allocation for each bottom-up project. For instance, in the Chuan government, 93.5 billion out of the total of 910 billion baht in FY 2001 were allocated to projects of local development, which include the “Development of Potentiality in Rural and Community People Program” (67.5 billion baht). It is reported that eight ministries and two government agencies were responsible for these projects, and necessary funds were delivered to each project through line ministry (BOB, Thailand’s Budget in Brief FY2001, 94–95). Such budget allocation typically shows the traditional style politics of clemency and charity targeting the rural poor people. In addition, the procedures of budget allocation must follow the 1959 Act of the Budget. This act was formulated by Puey Ungpakorn (Governor of BOT and Director of BOB in that day) and his associates in order to strictly separate central budget between investment expenditures based on economic planning and ordinary expenditures including personnel expenses (Suehiro 2005). In 1982, the Prem government changed Puey’s policy (British style) to the Planning Programming Budget System (American style) or PPBS for the sake of improving the consistency and the effectiveness of budget planning (BOB, Thailand’s Budget in Brief FY1982). Introduction of the PPBS was a part of policy conditionality required of the Thai government by the World Bank in exchange of its structural adjustment loans (SALs). Twenty years later, Thaksin ordered the BOB to replace the PPBS by a new policy of Strategic Performance Based Budget System or the SPBBS (Pran 2004, Vol. 1, 324–325). The new budget policy shifted the procedure of budget allocation from the bottom-up approach from line ministries to the top-down approach from the prime minister and the ruling party. Following the policy of the SPBBS, the BOB announced three major principles in budget planning: 1) putting priority on fiscal support of promoting the autonomy of local governments; 2) replacing function-based budget allocation by agenda-based one; and 3) introducing a four-year budget plan (FY2005–2008) for each agency in correspondence to the tenure of the second Thaksin government.30) All public agencies were forced to follow these principles, and to demonstrate definitely the necessity of each particular project with reference to state strategies addressed by the prime minister. Such policies are completely interconnected with the shift of policy-making system from a Five-Year Plan to state strategies as mentioned in section III. 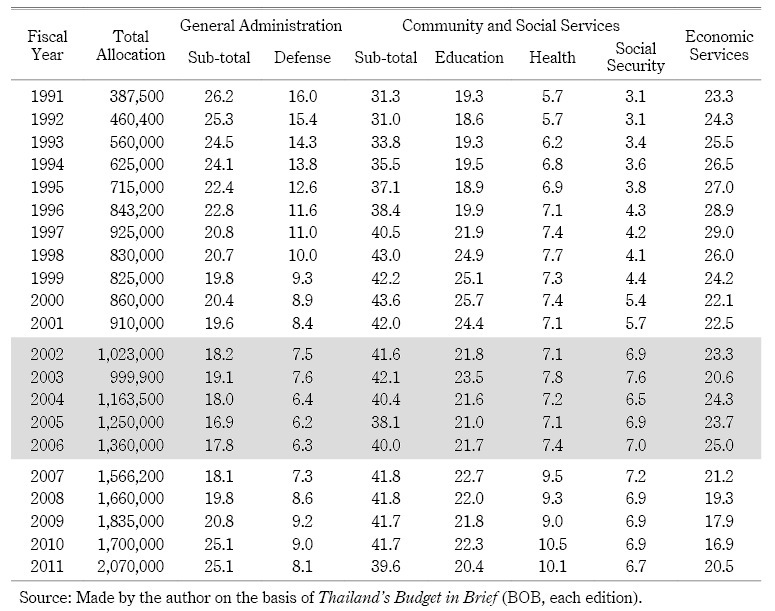 Table 7 traces the budget allocation by functions, in the period of between FY1991 and FY2011, including the period of Thaksin government (from FY2002 to FY 2006). According to the policy of the BOB, functions of budget allocation are classified into four major categories: 1) general administration or general government services (general public services, defense matters, public order, and security); 2) community and social services (education, public health, social security, housing, religions, etc. ); 3) economic services (energy, agriculture, manufacturing, transportation, communications, etc. ); and 4) mis­cellaneous and unclassified items (BOB, Thailand’s Budget in Brief FY2006, 62–65). Looking at the table, we can easily find remarkable changes in the period of the Thaksin government. First of all, the category of “national defense” showed a rapid decline in terms of percentage of allocation, which decreased from 16.0% in FY1991 through 8.9% in FY2000 to merely 6.3% in FY2006. Since the size of the total budget has increased by threefold in the corresponding period, the Ministry of Defense could maintain the same level in terms of actual value (see Fig. 3 in later). But it is apparent that the issue of national defense has been less important for the Thaksin government. In fact, he frequently addressed in his speeches that “the cold war regime collapsed and the era of competition for military expansion ended as well. We (Thailand) were facing a new era of economic competition in the world capitalism” (Shukan Tai Keizai, January 30, 2006). Such perception has naturally angered the military group, and became one of the leading causes behind the coup against Thaksin in September 2006. On the other hand, Table 8 summarizes the distribution of budget expenditures from the viewpoint of responsible institutions. Institutions are basically classified into six groups: central funds; ministries (19 ministries and the PMO in FY2006); independent public agencies (13 agencies); independent bodies under the 1997 Constitution (8 bodies); state enterprises (22 enterprises); and revolving funds (BOB, Thailand’s Budget in Brief FY2006, 75–86). The most prominent changes in budget allocation in the Thaksin government are the decline of ministries and increase of the central fund in terms of their percentages. Percentage of ministries had usually accounted for 84 to 87% of the total budget allocation until the FY1998. In FY1999, the National Police Office was separated from the Ministry of Interior, and was transferred to the status of independent public agency. Its budget or 38.1 billion baht accounted for 4.6% of the total amount in FY1999. If the National Police Office were included into ministries, line ministries continue to account for 84.9%, not 80.3% in the table.33) However, in the period of Thaksin government, the percentage of ministries dramatically decreased from 80.3% in FY1999 to 62.8% in FY2004 and 65.9% in FY2006. In contrast, central fund increased its percentage from 9.3% to 22.8% and 18.8% in corresponding fiscal years. The central fund or ngop klang is originally designed as a special fund to meet extra expenditures such as natural disasters, royal tours, additional payments for government employees, and special funds for early retirement of government officials. In addition to these items, two other categories took up sizable chunks of the central fund before the Thaksin government. These two include expenditures on government pensions and projects of emergency local development. Indeed, expenditures on government pensions accounted for as much as 40% of the total central fund in the Chuan government due to increasing number of government officials who reached retirement age. On the other hand, a project of “emergency local development” was frequently used as political instruments for each coalition government to attract supports from the rural people (Jarat 1995). Importantly, additional revenues continuously flowed into the state budget during each fiscal year under the Thaksin government (see section II of this article) and these additional revenues were transferred not to line ministries but to the central fund by order of the prime minister. Likewise, expenditures on the 30-baht medical services were delivered not to the Ministry of Public Health, but to another independent fund or “revolving funds.”35) By employing such techniques, Thaksin could promote his dual-track policies without any repercussions from ministries as well as economic technocrats. Mass media frequently attacked such management of budget allocation as an “off-budget system” or an arbitrary exploitation of state revenue. But this criticism misses the point because Thaksin’s technique does not violate any of the rules of the existing budget system.36) Nevertheless, increasing proportions of the central fund and revolving funds are not normal from the standpoint of maintaining sound management of national budget. Accordingly, in 2005, Thaksin ordered the BOB to set up ad hoc committee to reconsider and revise the 1959 Act of the Budget in favor of agenda-based budget system.37) But before a new budget could be enacted, Thaksin was ousted from political power by the military coup in September 2006. As mentioned in the first section of this article, Thaksin had a Janus-faced public image as populist and state reformist. As a populist, he launched a variety of policies in favor of the masses. In fact, according to the pole survey by ABAC, these policies attracted a great deal of support from the people: 84% for OTOP, 81% for the 30-baht medical services, and 79% for village funds scheme in contrast to 39% for anti-corruption campaign and 35% for restructuring of state enterprises (Tamada 2005, 182–183). Enormous popularity coupled with power concentration has resulted in a “strong prime minister.” Finally, a strong prime minister, intentionally or unintentionally, suggests another chief of state (Pramuk), and therefore a strong competitor to the king. Immediately after the great victory of TRT in 2005 general election, the Nation Weekly Magazine carried a special issue headlined “The Second Thaksin Government: Next is the Presidency?” (Nation Weekly Magazine 2005). In the context of Thailand, the presidential system is an alternative political form against the monarchy system. Therefore, Thaksin’s great victory in the general election was interpreted by a royalist-military group as a potential and serious menace to the monarchy system. At the same time, Thaksin’s reform of the budget system at the expense of defense matters has always irritated a military group. In addition, he directly intervened in the top personnel manage­ment of the military by appointing his cousin in 2003. These activities finally resulted in the counter-balancing activity of a royalist-military coup to oust Thaksin from the power in 2006 (Wasana 2008). On the other hand, Thaksin is an active state reformist. He promoted various reforms to modernize the Kingdom of Thailand: changes in the initiatives of policy ­making from technocrats to prime minister and TRT; changes in the principle of macro-economic management from a Five-Year Plan to a state strategy; changes in fiscal base of national projects from public debt to own state revenue; changes in the budget system from the function-based budget allocation to the agenda-based one; and changes in ­public sector from traditional bureaucracy to more efficient modern agencies. More importantly, his reforms also aimed to change the traditional culture of Thai bureaucracy and social values of the Thai people since he wished to develop Thailand into an advanced country under global capitalism. But his style of conducting reforms was too speedy and too radical for the Thai people. In addition, after the landslide victory of TRT in 2005 general election, Thaksin began to place more priority on the second track of his dual-track policies such as the NCP, the Mega Projects, and modernization of local stock market, which hardly delivered direct benefits to most people. Consequently, the people were disappointed with the second Thaksin government policies. Rather they tend to look at Thaksin’s efforts as reforms for his own interest rather than for the people. At this conjuncture, mass media disclosed that Thaksin had sold all the stocks of his family holding in Shin Corporation (telecommunications) to a Singaporean firm in exchange of 73.3 billion baht in cash (January 23, 2006). The Thai mass media immediately attacked his trade of stocks as an “unfair” move because Thaksin and his family did not pay any taxes for their earnings. At the same time, mass media also condemned Thaksin as a traitor to a country because he neglected a national interest (local investors) when he decided to sell his stocks. This incident became the catalyst for the anti-Thaksin movement among the people, especially among the middle-class in the Bangkok Metropolitan area, and it developed into the formation of the People’s Alliance for Democracy or PAD (so-called yellow shirts group) in February 2006 (Nariphon 2006; Pasuk and Baker 2009; Suehiro 2009, Ch. 6). Thaksin’s reform of the public sector also caused to provoke resistance among civil servants. Strategic Plan of the OPSDC was designed with Western key concepts imported from the outside of Thailand. But these concepts were unfamiliar to lower ranked officers who work at public service points. Furthermore, his reforms were inclined to destroy the traditional rules and comfortable culture of Thai bureaucracy such as seniority system and quasi-familial relationship. Civil servants were tired of meeting the strict guidelines imposed by the OPSDC. For these reasons, both the masses and the civil servants temporarily welcomed or accepted the military coup to end the Thaksin regime despite its apparent annulment of the gains of the democratization movement during the 1990s. Likewise, the new government restored the authority of the NESDB. The NESDB now neglected Thaksin-initiated state strategies and revised the 10th Five-Year Plan in accordance with the king’s philosophy of “sufficiency economy” (setthakit phophiang). Its action plan in July 2007 focused on social stability and public calm rather than economic development and modernization of a country. Along with the revival of bureaucracy, the government also restored traditional rule of budget allocation or function-based budget system in favor of line ministries, and quickly increased budge for defense matters (See Fig. 3). Source: Made by the author on the basis of Thailand’s Budget in Brief (BOB, each edition). Budget allocation for defense matters dramatically increased by 35% from 85 billion baht (6.3% of the total) in FY2006 to 115 billion baht (7.3%) in FY2007, while the central fund decreased by 20% from 243 billion baht (17.9%) to 194 billion baht (12.4%) in corresponding years (BOB, Thailand’s Budget in Brief FY2007). In FY2008 and FY2009, the budget allocation for defense matters continued to increase to 143 billion baht (increase by 24% as compared to the previous fiscal year) and to 168 billion baht (increase by 18%), respectively (BOB, Thailand’s Budget in Brief FY2008 and FY2009). These figures suggest the restoration of the military group’s status to the level before the Thaksin government (See also Table 7). All the moves above demonstrate the effort at resetting the situation of Thailand to the point just before the advent of the Thaksin regime or the effort to completely destroy Thaksinocracy. In the eyes of the new government, Thaksin is a virus that has invaded the computer of Thai society. Therefore, they had to quarantine the virus first and then reset both politics and society to “normal.” The final step of this reset is a court decision to order the dissolution of TRT and the cease of eligibility of 111 TRT executive members for election in next five years. This court decision of May 2007 signals the end of ­Thaksinocracy and the foreclosure of the possibility of Thaksin’s return to the political scene. However, this resetting work could not eliminate the influence of Thaksin from Thai politics. This is because the new government after the general election under the 2007 Constitution was transformed from an anti-Thaksin group into a pro-Thaksin group, namely, People’s Power Party (PPP). PPP was led by Samak Sundaravej who openly announced that he was willing to serve as the agent of Thaksin Shinawatra. But Samak was ousted from the premiership in September 2008, and Somchai Wongsawat, who succeeded Samak and Thaksin’s younger brother-in-law, was also forced to resign in December according to the orders of the Constitution Court. Finally, Abhisit Vejjajiva of Democrat Party was appointed the 27th prime minister in December 2008 as a result of political bargaining among Democrat Party, military group, royalist members, and anti-Thaksin groups. Such a political bargaining without democratic procedures created another political conflict between an anti-Thaksin group (a yellow shirts group or PAD and ruling parties) and a pro-Thaksin group (a red shirts group or the United Front of Democracy against Dictatorship [UDD] and opposition parties) at the end of 2008.38) In 2010, anti-­government movement led by UDD has quickly grown up into big rallies due in part to the financial support from Thaksin outside Thailand and in part to the economic recession originated in a global financial crisis in 2008. Finally political conflict between UDD and the government (the military) developed into a blood-shed incident in May 2010 (Montesano et al. 2012). Generally speaking, it is known that the income gap in terms of the gini index tends to expand when a certain country is moving from a lower-income country into a middle-income country. This hypothesis, or a Kuznet’s reverse U-shape curve, is precisely adaptable to the case of Thailand. Indeed, the gini index of Thailand increased from 0.43 in 1980 to 0.50 in 1987, and further to 0.54 in 1992 (UNDP 2007, 23).41) It is apparent that income distribution has deteriorated during the economic boom. Crucially, Thaksin is the first prime minister to actually tackle the problems of Thailand as a middle-income country. His state reforms primarily aimed to narrow the gap between economic status of Thailand as a middle-income country and old-fashioned government agencies to handle economic problems. He focused on inequality of opportunity (few business chances in rural areas) rather than inequality of result (poverty in rural areas). Contrary to previous governments, which put priority on poverty reduction, Thaksin emphasized the necessity of creating business chances and community businesses in rural area (village funds, people’s bank, OTOP). Intentionally or unintentionally, his new approach seems to have politically awakened the rural people. They are now focusing their attention on their disadvantaged economic status and the inadequate policies adopted by the traditional ruling elites, and further afield on the state regime itself. If this hypothesis is true, then any government will have to face the necessity and challenge of solving the various problems facing contemporary Thailand as a middle-income country, problems such as upgrading of industrial structure, resolving income and/or assets disparity in urban and rural areas through creation of jobs and businesses opportunities, fundamental reforms of tax system including individual income tax, property tax, and inheritance tax (phasi moradok), construction of social security system, especially a national pension scheme, and, finally, improvement of public services. In August 2011, Yingluck Shinawatra, the youngest sister of Thaksin, became the 28th prime minister in Thailand after the victory of her political party (Pheu Thai Party) in the 2011 general election.42) Does this political incident provide a new opportunity for ­Thaksin to return to political arena and create the incentive for a new government to revive uncompleted Thaksin’s reforms in Thailand? My answer is a negative one. ­Thaksin himself is not a creative destroyer of Thai state anymore. Now he turns into a pure and simple destroyer for Thai society. New government led by Yingluck also has neither intention nor ability of promoting constructive state reforms because they must depend heavily on both populist policies and revived bureaucracy. Nevertheless, state reforms attempted by Thaksin during his administration are still needed as long as Thailand wishes to maintain or improve its economic status and develop into a more advanced country in the future. On the other hand, Thai people rejected his reforms because these reforms were too speedy and too radical from the standpoint of Thai social value (preference of medium). At the same time, his reforms put priority on business interests rather than social justice. Accordingly, Thailand needs not Thaksin himself or another Thaksin, but a new political leader who will be able to harmonize modernization of Thai state with the happiness and well-being of the people on the basis of Thai social values (Thainess). Ammar Siamwalla et al. 1997. Thailand’s Boom and Bust: Collected Papers. Bangkok: Thailand Development Research Institute. Anek Laothamatas. 1992. Business Associations and the New Political Economy of Thailand: From Bureaucratic Polity to Liberal Corporatism. Boulder: West View. Apichat Satitniramai. 2002. The Rise and Fall of the Technocrats: The Unholy Trinity of Technocrats, Ruling Elites and Private Bankers and the Genesis of the 1997 Economic Crisis. Ph.D. dissertation, University of Wales, Swansea, UK. Athiwat Sapphaithun อธิวัฒน์ ทรัพย์ไพฑูรย์. 2003. Trakun Chinnawat: Phu Sansang “Shin Corp.” Su “Chao-yutthajak Thurakit Thorakhomanakhom” khong Thai ตระกูลชินวัตร: ผู้สรรค์สร้าง “ซินคอร์ป” สู่ “เจ้ายุทรจักรธุรกิจโทรคมนาคม” ของไทย [Shinawatra family: From the founder of Shin Corporation to a strategist of telecommunications]. Bangkok: Wannasan. Bank of Thailand. Website. Accessed October 1, 2013, http://www.bot.or.th/Thai/Statistics/. Bhidhaya Bowornwathana. 2004. Thaksin’s Model of Government Reform: Prime Ministerialization through “A Country Is My Company” Approach. Asian Journal of Political Science 12(1): 135–153. Funston, John, ed. 2009. Divided over Thaksin: Thailand’s Coup and Problematic Transition. Singapore: Institute of Southeast Asian Studies. Government of Thailand. 2002. Racha-kitchanubeksa ราชกิจจานุเบกษา [Royal Thai Government gazette]. Bangkok: The Cabinet Secretariat, the Office of Prime Minister. Jarat Suwannamala จรัส สุวรรณมาลา. 1995. Pathirup Rabop Kan Khlang Thai: Krajai Amnart su ­Phumiphak lae Thongthin ปฏิรูประบบการคลังไทย: กระจายอำนาจสู่ภูมิภาคและท้องถิ่น [Fiscal reforms of Thailand: Decentralization]. Bangkok: Khleg Thai. Kawamori Masato 河森正人. 2009. Tai no Iryo Fukushi Seido Kaikaku タイの医療福祉制度改革 [Reforms of medical welfare system in Thailand]. Tokyo: Ochanomizu Shobo. Krom Sulakakorn กรมศุลกากร. 1994. Thi Raluk Wan Sathapana Krom Sulakakorn Khrop Rop 120 Pi ที่ระลึกวันสถาปนากรมศุลกากร ครบรอบ ๑๒๐ปี [120 anniversary memorial book on the Department of Customs]. Bangkok: Department of Customs. Matichon Weekly Magazine, ed. 2002. Cover Story: Absolute Power Corrupts Absolutely. Matichon Sutsapda มติชนสุดสัปดาห์ 22 (1125): 11–17. McCargo, Duncan; and Ukrist Pathmanand. 2005. The Thaksinization of Thailand. Copenhagen: NIAS Press. Montesano, Michael J.; Pavin Chachavalpongpun; and Aekapol Chongvilaivan, eds. 2012. Bangkok, May 2010: Perspectives on a Divided Thailand. Singapore: Institute of Southeast Asian Studies. Muscat, Robert. 1994. The Fifth Tiger: A Study of Thai Development Policy. Helsinki: United Nations University Press. Nakharin Maektrairat ナカリン・メークトライラット. 2008. Takkushin Seiken-ki no Gyosei Kaikaku タックシン政権期の行政改革 [Reforms of the public sector under the Thaksin regime]. In Tai Seiji, Gyosei no Henkaku 1991–2006 Nen タイ政治・行政の変革1991–2006年 [Thailand in motion: Political and administrative changes, 1991–2006], edited by Yoshifumi Tamada 玉田芳史 and ­Tsuruyo Funatsu 船津鶴代, pp. 203–235. Chiba: JETRO Institute of Developing Economies. Nagai Fumio 永井史男. 2008. Chiho Bunken Kaikaku: “Gorika Naki Kindaika” no Kiketsu 地方分権改革―「合理化なき近代化」の帰結 [Decentralization: The result of “modernization without rationalization”]. In Tai Seiji, Gyosei no Henkaku 1991–2006 Nen タイ政治・行政の変革1991–2006年 [Thailand in motion: Political and administrative changes, 1991–2006], edited by Yoshifumi Tamada 玉田芳史 and Tsuruyo Funatsu 船津鶴代, pp. 117–158. Chiba: JETRO Institute of Developing Economies. Nariphon Phetcharadee นฤพน เพชรดี, ed. 2006. Banthuk Prawatthisat 2549: Lom !! Rabop Thaksin บันทึกประวัติศาสตร ๒๕๔๙ ล้ม!! ระบอบทักษิณ [Documents in 2006: Collapse of the Thaksin regime]. Bangkok: ­Ruabai. Nation Weekly Magazine, ed. 2005. Nayok Thaksin Samai-thi 2 Borihan Baep Prathanathibodi นายกทักษิณสมัยที่๒ บริหารแบบประธานาธิบดี [The second Thaksin government, next target is the presidency?]. Nation Sutsapda 13(667). National Economic and Social Development Board (NESDB). 2006. Rang Phaen Phatthana Setthakit lae Sangkhom haeng Chart Chabap thi Sip Pho. So. 2550–2554 ร่างแผนพัฒนาเศรษฐกิจและสังคมแห่งชาติ ฉบับที่สิป พ.ศ.๒๕๕๐–๒๕๕๔ [Draft of the 10th Five-Year Economic and Social Development Plan, 2007–2011]. Bangkok: NESDB. ―. 2005. Rai-ngan Kan Tittam Pramoen Phon-kan Phatthana Setthakit lae Sangkhom khong Prathet: 3 Pi khong Phaen Phatthana Chabap thi 9 รายงานการติดตามประเมิน ผลการพัฒนาเศรษฐกิจและสังคมของประเทศ: ๓ปีของแผนพัฒนา ฉบับที่๙ [Evaluation report on the national economic and social development: Three years of the Ninth Plan]. Bangkok: NESDB. ―. 2003a. Thailand in Brief 2003. Bangkok: NESDB. ―. 2003b. Rai-ngan Kan Pramoen Nayobai Setthakit Rak-ya lae Lak Prakan Sangkhom รายงานการประเมิน นโยบายเศรษฐกิจรากหญ้า และหลักประกันสังคม [Evaluation report on policies concerning the promotion of grass-roots economy and social security infrastructure]. Bangkok: NESDB. ―. 2003c. Executive Summary of National Competitiveness Plan. Bangkok: NESDB. Nidhi Aeusriwongse นิธิ เอียวศรีวงศ. 2006. Watthanatham Khon yang Thaksin วัฒนธรรมคนอย่างทักษิณ [Culture of human being like Thaksin]. Bangkok: Matichon. Nihon Tai Kyokai 日本タイ協会, ed. 2008. Gendai Tai Doko 2006–2008 現代タイ動向 2006–2008 [Political affairs of contemporary Thailand, 2006–2008]. Tokyo: Mekong Publishing. Niwat Kanjanaphoomin. 2004. Pension Fund, Provident Fund and Social Security System in Thailand. A paper presented at the International Conference on “Pensions in Asia: Incentives, Compliance and Their Role in Retirement,” organized by Hitotsubashi University at Tokyo, February 23–24, 2004. Ockey, James. 2005. Making Democracy: Leadership, Class, Gender, and Political Participation in Thailand. Chiang Mai: Silkworm Books. Office of Public Sector Development Commission (OPSDC) (Samnakngan Ko. Pho. Ro. สำนักงาน ก.พ.ร.). 2005a. Rai-ngan Khwam Kaona khong Kan Phatthana Rabop Rachakan nai Rop 3 Pi รายงานความก้าวหน้า ของการพัฒนาระบอบราชการ ในรอบ๓ปี [Interim report on public sector development for the past three years]. Bangkok: OPSDC. ―. 2005b. Phaen Pathibat Rachakan 4 Pi แผนปฎิบัติราชการ ๔ปี [The four year action plan of public sector development]. Bangkok: OPSDC. Pasuk Phongpaichit; and Baker, Chris. 2009. Thaksin: Second Expanded Edition. Chiang Mai: Silkworm Books. ―, eds. 2008. Thai Capital after the 1997 Crisis. Chiang Mai: Silkworm Books. ―. 2007. Coup in Thailand and Democratization. A paper presented at the Workshop on “Thailand after the Military Coup,” organized by the Institute of Social Science, the University of Tokyo, January 16, 2007. ―. 2004. Thaksin: The Business of Politics in Thailand. Chiang Mai: Silkworm Books. ―. 2000. Thailand’s Crisis. Chiang Mai: Silkworm Books. Porter, Michael. 2003. Thailand’s Competitiveness: Creating the Foundations for Higher Productivity. Bangkok: NESDB. Pran Phisit-setthakan ปราณ พิสิฐเศรษฐการ, ed. 2004. Thaksinomics, Ruam Suntharaphot Samkhan khong Pho.To. Tho. Dr. Thaksin Chinnawat ทักษิโณมิกส์: รวมสุนทรพจน์สำคัญ ของพ.ต.ท.ดร.ทักษิณ ชินวัดร [Collections of important speeches of police general, Dr. Thaksin Shinawatra]. 3 vols. Bangkok: Matichon. Rungsan Thanaphonphan รังสรรค์ ธนะพรพันธุ์. 2005. Jak Thaksinomics su Thaksinathipatai จาก Thaksinomics สู่ ทักษิณาธิปไตย [From Thaksinomics to Thaksinocracy]. Bangkok: Open Books. ―. 1996. Setthakit Kan-khlang kap Botbat Ratthaban Thai เศรษฐกิจการคลัง กับบทบาทรัฐบาลไทย [Public finance and the role of Thai government]. Bangkok: Khret Thai. Samnak Lekhathikan Khana Rattamontri สำนักเลขาธิการ คณะรัฐมนตรี. 2002. Rai-ngan Sadaeng PhonkanDamnoenkan khong Khana Rattamontri Tam Naew Nayobai Phunthanhaeng Rat, Rattaban Phan Tamruat Tho Thaksin Chinnawat Pi thi 1 รายงานแสดงผลการดำเนินการของคณะรัฐมนตรี ตามแนวนโยบายพื่นฐานแห่งรัฐ, รัฐบาล พันตำรวจโท ทักษิณชินวัตร ปีที่๑ [Report on the achievement of the cabinet according to the basic policies of the state: Police general Thaksin Shinawatra government in the first year]. Bangkok: The Cabinet Secretariat, the Office of Prime Minister. Samnakngan Ngop-praman สำนักงานงบประมาญ. 2006. Ngop-praman Raijai Prajam Pi Ngop-praman Pho. So. 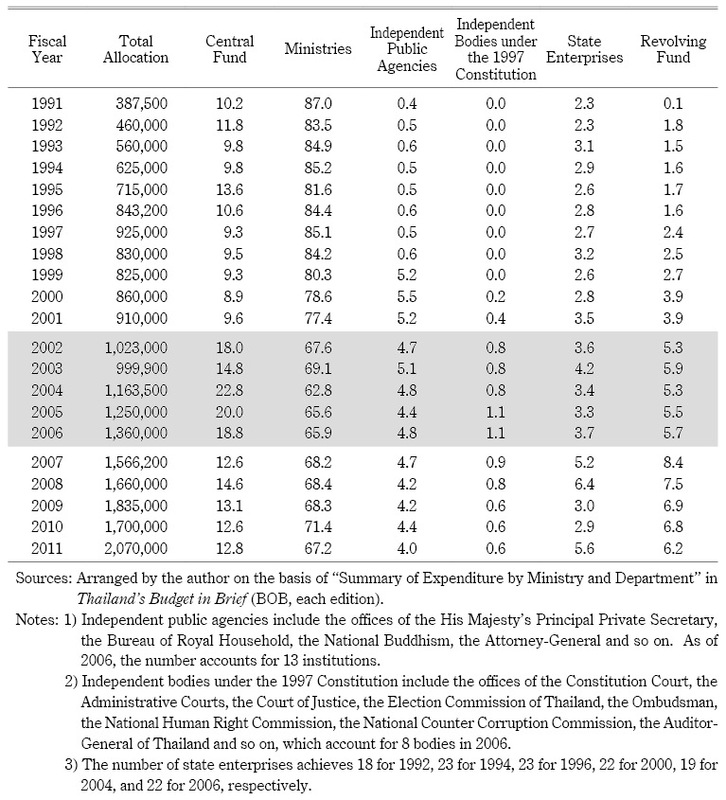 2549 งบประมาญรายจ่าย ประจำปีงบประมาญ พ.ศ.๒๕๔๙ [Ordinary budget expenditures in FY2006]. Bangkok: Baphit Kan Phim. Shukan Tai Keizai Henshubu 『週刊タイ経済』編集部. 2006. Megapurojekuto Keikaku メガプロジェクト計画 [Plan of mega project]. Shukan Tai Keizai 週刊タイ経済, January 30, 2006. ―. 2001. Tai Rakku Tai To no Keizai Seisaku タイラックタイ党の経済政策 [Economic policy of the Thai Rak Thai Party]. Shukan Tai Keizai 週刊タイ経済, January 5, 2001. Somkid Jatusripitak สมคิด จาตุศรีพิทักษ์. 2001. Wisaithat Khun Khlang Somkid: Waduai Naew Khit lae Kolayut Borisat Prathet Thai วิศัยทัศน์ขุนคลังสมคิด: ว่าด้วยแนวคิด และกลยุทธ์บริษัทประเทศไทย [Vision of finance minister Somkid: Direction and tactics of Thailand Company]. Bangkok: Phu Chatkan. Somucho Chokan-kambo Kikaku-ka 総務庁長官官房企画課. 1995. Tai no Gyosei タイの行政 [Administration in Thailand]. Tokyo: Somucho. Sorakon Adunyanon สรกล อดุลยานนท์. 1993. Thaksin Chinnawat: Assawin Khlun Lukthi Sam ทักษิณ ชินวัตร: อัศวินคลื่นลูกที่สาม [Thaksin Shinawatra: The knight of the third wave]. Bangkok: Matichon. Suehiro Akira 末廣　昭. 2014. Shinko Ajia Keizai-ron: Kyacchiappu o Koete 新興アジア経済論―キャッチアップを超えて [Emerging Asian economies: Beyond the catch-up industrialization]. Tokyo: Iwanami Publisher. ―. 2010. Industrial Restructuring Policies in Thailand: Japanese Approach or American Approach. In Sustainability of Thailand’s Competitiveness: The Policy Challenges, edited by Patarapong Intarakumnerd and Yveline Lecler, pp. 129–173. Singapore: Institute of Southeast Asian Studies. ―. 2009. Tai: Chushin-koku no Mosaku タイ―中進国の模索 [Thailand: Challenges of a middle-income country]. Tokyo: Iwanami Publisher. ―. 2008. Keizai Shakai Seisaku to Yosan Seido Kaikaku: Takkushin Shusho no “Tai Okoku no Gendaika Keikaku” 経済社会政策と予算制度改革―タックシン首相の「タイ王国の現代化計画」 [Socio-economic policies and reform of the budget system: “The Kingdom of Thailand modernization framework” led by prime minister Thaksin]. In Tai Seiji, Gyosei no Henkaku 1991–2006 Nen タイ政治・行政の変革1991–2006年 [Thailand in motion: Political and administrative changes, 1991–2006], edited by Yoshifumi Tamada 玉田芳史 and Tsuruyo Funatsu 船津鶴代, pp. 237–285. Chiba: JETRO Institute of Developing Economies. ―. 2007. Catch-up Industrialization: The Trajectory and Prospects of East Asian Economies. Singapore: National University of Singapore Press. ―. 2006. Famiri Bijinesu-ron: Kohatsu Kogyoka no Ninaite ファミリービジネス論―後発工業化の担い手 [Family business: Agents of late industrialization]. Nagoya: Nagoya University Press. ―. 2005. Who Manages and Who Damages the Thai Economy? The Technocracy, the Four Core Agencies System and Dr. Puey’s Networks. In After the Crisis: Hegemony, Technocracy and Governance in Southeast Asia, edited by Takashi Shiraishi and Patricio N. Abinales, pp. 15–68. Kyoto: Kyoto University Press; Melbourne: Trans Pacific Press. ―. 2000. Asian Crisis and Economic and Social Restructuring: Americanization and Social Governance. In Developing Economy in the Twenty-First Century: The Challenges of Globalization, edited by Ippei Yamazawa, pp. 9–24. Chiba: JETRO Institute of Developing Economies. ―. 1995. Chinawatto Gurupu: Tai no Joho Tsushin Sangyo to Shinko Zaibatsu チナワットグループ―タイの情報通信産業と新興財閥 [The Shinawatra group: Telecommunications industry and newly emerging business groups in Thailand]. Ajia Keizai アジア経済 36(2): 25–60. Suehiro Akira 末廣　昭; and Higashi Shigeki 東　茂樹, eds. 2000. Tai no Keizai Seisaku: Seido, Soshiki, Akuta タイの経済政策―制度・組織・アクター [Economic policy in Thailand: Institutions and actors]. Chiba: JETRO Institute of Developing Economies. Supawan Rojanapakorn สุภวรรณ รจนาปกรณ์, ed. 2003. Khon Khwam-khit Thaksin Shinawatra: Jak Rai-ngan “Nayok Thaksin Khuikap Prachachon” คนความคิด ทักษิณ ชินวัตร: จากรายงาน “นายกทักษิณคุยกับประชาชน” [Thaksin as a thinker: Prime Minister Thaksin talk with peoples]. 4 vols. Bangkok: Wannasan. Tamada Yoshifumi 玉田芳史. 2005. Takkushin Seiken no Antei: Hossoku 3 Nemme niatatte タックシン政権の安定―発足3年目にあたって [Stability of the Thaksin government: Three years experience]. Ajia, Africa Chiiki Kenkyu アジア・アフリカ地域研究 4(2): 167–194. ―. 2003. Minshuka no Kyozo to Jitsuzo: Tai Gendai Seiji Hendo no Mekanizumu 民主化の虚像と実像―タイ現代政治変動のメカニズム [Real and virtual images of democratization: Political changes in contemporary Thailand]. Kyoto: Kyoto University Press. Tamada Yoshifumi 玉田芳史; and Funatsu Tsuruyo 船津鶴代, eds. 2008. Tai Seiji, Gyosei no Henkaku 1991–2006 Nen タイ政治・行政の変革1991–2006年 [Thailand in motion: Political and administrative changes, 1991–2006]. Chiba: JETRO Institute of Developing Economies. United Nations Development Programme (UNDP). 2007. Thailand Human Development Report 2007: Sufficiency Economy and Human Development. Washington D.C.: UNDP. Vishnu Krua-ngam วิษณุ เครืองาม. 2002. Kan Patirup Rabop Rachakan การปฏิรูบระบบราชการ [Administrative reforms]. Bangkok: Samnak Nayok Rattamontri. Warr, Peter G.; and Bhanupong Nidhiprabha, eds. 1996. Thailand’s Macroeconomic Miracle: Stable Adjustment and Sustainable Growth. Washington, D.C.: World Bank; Kuala Lumpur: Oxford University Press. Wasana Nanuam วาสนา นาน่วม. 2008. Lap Luang Phrang: Pathiwat Prasat-sai ลับลวงพราง: ปฏิวัติปราสาททราย [Deception: Revolution to build a castle in the air]. Bangkok: Matichon. Wichai Boonlua วิชัย บุญเหลือ, ed. 2006. Pit Tamnan Thaksin ปิดตำนานทักษิณ [Shut the textbook on the Thaksin style]. Bangkok: Matichon. Wirat Saengthongkham วิรัตน์ แสงทองคำ. 2001. Somkid Jatusripitak สมคิด จาตุศรีพิทักษ์. Phu Chatkan Rai-duan ผู้จัดการ รายเดือน 18(211): 64–103. Worawan Chandoevwit. 2003. Thailand’s Grass Roots Policies. TDRI Quarterly Review 18 (2): 3–8. World Bank. 2001. Thailand Social Monitor: Poverty and Public Policy. Bangkok: World Bank Office Bangkok. 1) Text is quoted from a provisional English translation by Pasuk and Baker (2007). 2) According to the survey of the Assumption Business Administration College or ABAC in October 2006, 71% of the people were in favor of the Surayud Julanonda temporary government. However, slow-paced response to rural people’s problems eroded popular support for the new government and support, which quickly dropped to 35% in February 2007. See Pasuk and Baker (2009) and Suehiro (2009, Ch. 6). 3) “An ambitious populist” here implies another king as great father of a country, who provides support to all the people with great mercy. Nidhi analyzes the presence of Thaksin as a competitor to the king in the context of Thai political culture of the patrimonial state (Nidhi 2006). 4) For more detailed study on backgrounds and the progress of 30-baht universal health services in reference to the reformist groups in the Ministry of Public Health, see Kawamori (2009). 5) Concerning the collection of speeches of Thaksin, a lot of books are available. Among them, three volume books edited by Pran Phisit-setthakan (2004) are the best ones, which consist of Vol. 1 (Thaksinomics and a CEO Country), Vol. 2 (Thaksin and Social Policies), and Vol. 3 (Thaksin as a Leader in Asia and the World). 6) Thaksin himself defined the CEO system as a system of moderator, or rabop chaophap (Pran 2004, Vol. 1, 294–295) or a system of integrator of organizations, or phu-wa buranakarn (ibid., Vol. 2, 223–233). 7) For a detailed account of the development of Thaksin’s business activities, see Sorakon (1993), Suehiro (1995; 2006, Ch. 4), Athiwat (2003), and Pasuk and Baker (2004, Ch. 2). 8) The objectives of dual-track policies were explained by Thaksin himself in his speech in Manila, the Philippines, on September 8, 2003 (Pran 2004, Vol. 1, 26–38). 9) In August 2011, Yingluck Shinawatra, the youngest sister of Thaksin, was appointed a prime minister owing to a victory of pro-Thaksin political party in a general election of July 2011. 10) Increase of private consumption can be attributed partially to rapid growth of consumer’s credit (mini bubble economy) in the period of the Thaksin administration. Indeed, outstanding consumer’s credit doubled, from 72.5 billion baht in the end of 2002 to 143.5 billion baht at the end of 2005 (Bank of Thailand website). 11) Additional state revenue amounted to 48 billion baht in FY 2002, 146 billion baht in FY 2003, and 89 billion baht in FY 2004, respectively. Original estimated revenue in each year was around 1,000 billion baht, and then surplus accounted for 5% to 15% of the total (See Table 7 of this article). 12) For more information on the decision-making process of economic policies in Thailand, see Muscat (1994), Warr and Bhanupong (1996), Suehiro and Higashi (2000, Ch. 1), and Suehiro (2005). 13) After the currency crisis, Japanese government provided a huge amount of credits through the Miyazawa Plan and extra yen credits between 1998 and 1999 (Suehiro 2009, 64–65). 14) The total number of cabinet members accounted for 26 to 44 persons between 1973 and 1990, while deputy ministers accounted for 12 to 21 persons in corresponding period. The Anant government in 1992 reduced its members to 26 persons and 8 persons respectively due to the nature of temporary government after the May bloody incidents in 1992. 15) Author’s interview with Patcharee Siroros in Bangkok, February 1999. 16) Such key persons in the Thaksin government include Pansak Vinyaratn (prime minister’s advisor), Vishnu Krua-ngam (chairman of the Public Sector Development Commission), and Kittidej Sutsukorn (advisor to the Industry Minister), who came from policy advisory team of the Chatichai government (Nakharin 2008). 17) The full name of the committee is the Committee on Strategies and Tactics to Solve National Urgent Problems. 18) All of Thaksin’s speeches at the radio broadcasting until 2003 are edited and included in Supawan (2003). This style of direct dialogue with the people was adopted by the Samak government and the Abhisit government (on TV). 19) Interview conducted by the author with the TRT’s executive committee members in Bangkok, March 2001. 20) These business groups changed their strategies in favor of the Thaksin government in July 2006, and shifted their political donations to the Democrat Party. 21) Author’s interview with the NESDB staffs in Bangkok, August 2001. This plan is officially named a “Strategies for Improvement of Quality of Economic Growth and Sustainable National Economic Development 2001–2006,” which consists of two parts and 28 items. 22) For a comparative study on the objectives, the process of policy-making, and the institutional framework between the IRP and the NCP, see Suehiro (2010). 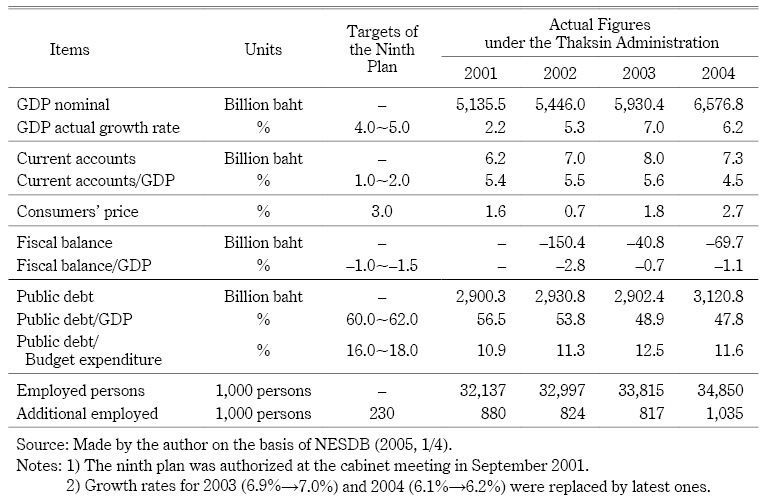 23) In October of 2005, March and June of 2006, the NESDB submitted again and again revised drafts to the cabinet meeting because there was a sharp conflict between the Thaksin’s own ideas based on his state strategy and the NESDB’s original proposals based on the philosophy of “sufficiency economy” (setthakit phophiang) propounded by the king. For an account for the ideas behind the “sufficiency economy,” see UNDP (2007) and Suehiro (2009, Ch. 4). 24) Thaksin preferred to use the term “the economy of speed” rather than “the economy of scale,” because he liked very much the book, Business at the Speed of Thought, by Bill Gates of Microsoft Corporation (Pran 2004, Vol. 1, 177; Vol. 2, 338). 25) Position and classification (P.C.) system for government officers was officially abolished by the Thaksin government before the 2006 military coup. 26) These fact findings and description on the rule of personnel management are based on the author’s survey on 750 persons in director generals and permanent secretaries in major ministries. This work was conducted in cooperation with Ukrist Pathmanand of Chulalongkorn University in 2004 and 2005. 27) For more detail information on reorganization of the government agencies, see two royal degrees concerning “Reforms of Ministries and Departments” on October 2, 2002 (in Thai), which are included into the Racha-kitchanubeksa (Royal Thai Government Gazette), Vol. 119, Part 99 Ko. (pp. 14–34) and Part 102 Ko. (pp. 66–85). 28) For more on Vishnu’s idea of administrative reforms, see Vishnu (2002). 29) Author’s interview with Nakharin Maektrairat, the Dean of Faculty of Political Science of Thammasat University in June 2006, in Tokyo. Concerning the implementation of “Strategic Plan for Public Sector Development,” Thaksin himself explicitly underlined its necessity in his speech of September 21, 2003 with the title of “Development of the Quality of Our Country under the CEO Regime” (Pran 2004, Vol. 1, 73–87). 30) Interviews conducted by the author at the Research and Planning Division of the BOB in August 2006, in Bangkok. 31) An idea of nation-wide pension scheme was abolished later due to the budget constraints. For an overview of social security system in Thailand, see Niwat (2004). 32) After the 2006 coup, the percentages of economic services have further decreased due to political needs of increasing general administration and health services. 33) In the process of reorganizing the government sector in October 2002, Thaksin changed again the status of the National Police Office into an independent body under the direct control of the prime minister. So, it is not adequate to integrate the budge of the National Police Office into line ­ministries. 34) After the end of the Thaksin government, the budget allocation for the central fund reincreased from 198 billion baht in FY2007 to 266 billion baht in FY2011. This recovery should be attributed to rapid increase of government subsidies for pensions and health insurance schemes for government officials. 35) Budget allocation of “30-baht medical services” amounted to 22 billion baht for FY2002, 27 billion baht for FY2003, 30 billion baht for FY2004, 36 billion baht for FY2005, and 40 billion baht for FY2006, respectively. After the 2006 coup, the Surayud government decided to reorganize the 30-baht medical services into a free medical services. As its result, budget allocation for health services in “revolving funds” jumped to 75 billion baht in FY2007 and finally increased to 101 billion baht in FY2011 (BOB, Thailand’s Budget in Brief, each edition). 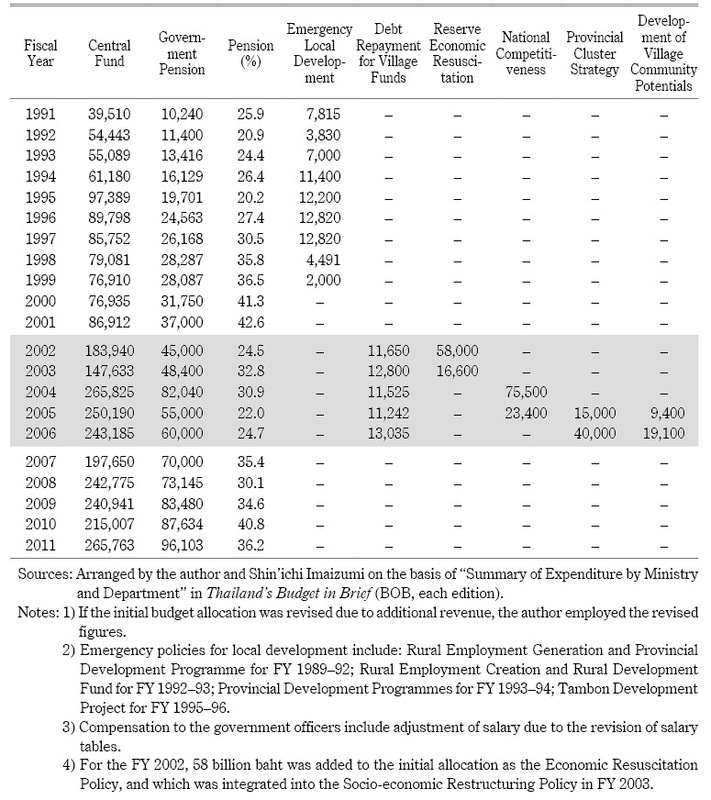 36) For the case of village funds (77.5 billion baht), the Thaksin government appropriated a total of 60.5 billion baht from FY2002 to FY2006 in the Central Fund for the particular purpose of debt repayment (see Table 9). This implies that even if the majority of village funds resulted in non-performing loans (the worst scenario), the state could still recoup these debts. 37) Contrary to Thaksin’s expectation, the ad hoc committee addressed the basic idea of emphasizing the fiscal autonomy of local governments rather than agenda-based budget system, and was reluctant to revise the 1959 Act of the Budget in line with Thaksin’s idea. Interviews conducted by the author with the staffs of the BOB and Nakharin Maektrairat, a member of the ad hoc committee, in August 2006, in Bangkok. 38) For accounts of the political turmoil in Thailand since 2006, see Funston (2009), Pasuk and Baker (2009), Suehiro (2009), and Montesano et al. (2012). 39) “Ammathayathipatai” usually means a bureaucracy. Since 2009, however, it seems to have implied a political regime under the feudal system (Sakdina system) of Thailand in which common people (phrai) were forced to be subordinate to the king and high-ranked bureaucrats (ammat). Red-shirts group used the term “wirachon” as their key identical concept (Hero of a country, the key concept for the first democratization movement during the 1970s) in 2008 and 2009, but changed it to a “phrai” from the year of 2010. 40) In 2010, the World Bank announced that Thailand became a member of middle-income country (a country of per capita GNP from USD3,706 to 11,456). This implies that Thailand successfully upgraded her economic status from a developing country to a semi-advanced country. 41) Gini index of Thailand have slightly decreased from 0.43 in 2000 through 0.43 in 2006 to 0.39 in 2010. Economic inequality, therefore, has not been improved during the 2000s in comparison to rapid decline of poverty population in the same period (Suehiro 2014, Ch.8). 42) Prime Minister Yingluck lost her post by the order of the Constitutional Court on May 7, 2014, and the royalist-military group conducted the military coup d’etat again on May 22.